Hardwood Flooring – Hardwood flooring has remained a popular flooring choice for centuries. There are many benefits to hardwood floors. Hardwood floors offer a wide range of choices with regard to styles and stains. They will stand the test of time, as they can be refinished as they begin to look worn, rather than needing to be replaced. Hardwood floors are also very easy to clean, and are extremely durable. Wood-Look Tile – Wood-look tile has become one of the most popular trends in tile flooring today. It is porcelain tile that is often nearly impossible to tell apart from actual hardwood flooring. The benefits of wood-look tile flooring are that it is very durable, and it is easy to clean and maintain. Ceramic Tile – Ceramic tile is a classic choice for your kitchen floor. There are a variety of benefits to ceramic tile, including the wide variety of colors. Additionally, ceramic tile is easy to maintain. It is extremely durable, and resists almost all dents, dings and scratches. Terracotta Tile – Terracotta tile is a rustic flooring tile look. The natural variation in the tone of the tiles gives your floor added texture. The tiles come in various shapes and sizes, including square, brick or hexagon, which adds even more dimension to your stylish kitchen. Travertine Tile – Travertine tile is another classic choice that is a stone tile. Travertine tiles can give a sense of greatness to your kitchen space. They typically come in neutral color tones, with a variety of texture options. Travertine tiles are durable and will stand up well to heavy kitchen traffic. Ceramic/Porcelain Tiles – Ceramic or porcelain tiles remain the most commonly used backsplash materials. They offer an endless number of style options to choose from. Most ceramic/porcelain tiles are glazed and have a non-porous finish. If they do not, you should be careful, as they will stain easier. Glass Tiles – Glass tiles have become very popular in the last several years. Color options for glass tiles are infinite. Glass tiles can cover your entire backsplash, or be used as an accent. Another positive with glass tiles is that many are made from recycled glass materials. Metal Tiles – Metal tiles are a unique way to add a polished look to your kitchen design. 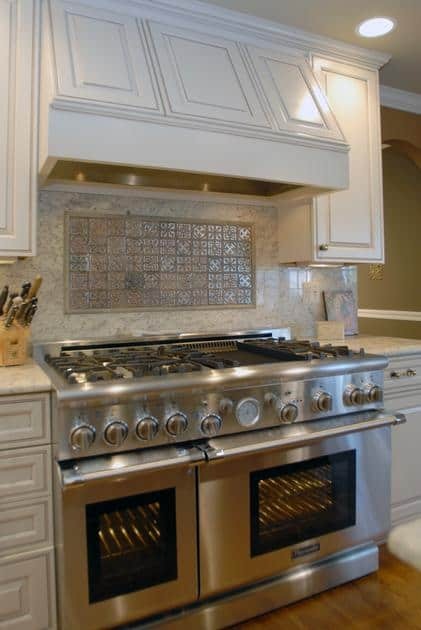 Stainless steel, whether satin or brushed, can accent stainless steel appliances in your kitchen. 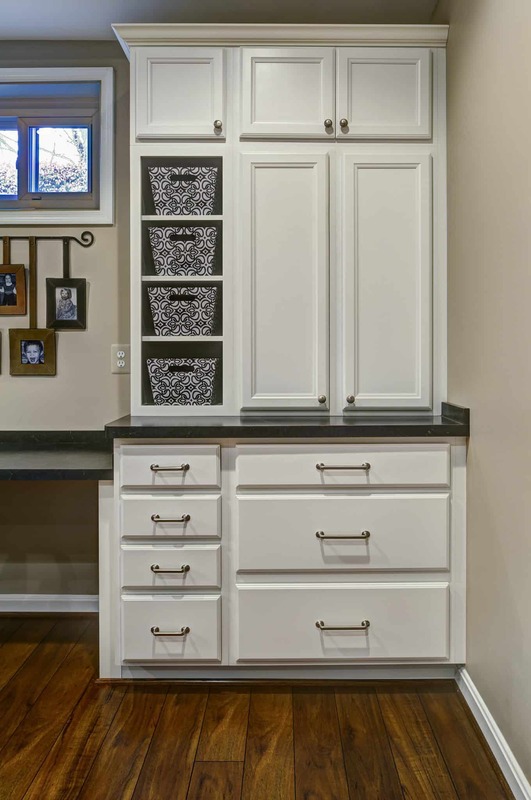 Metals such as bronze or copper can accentuate a more traditional kitchen style. 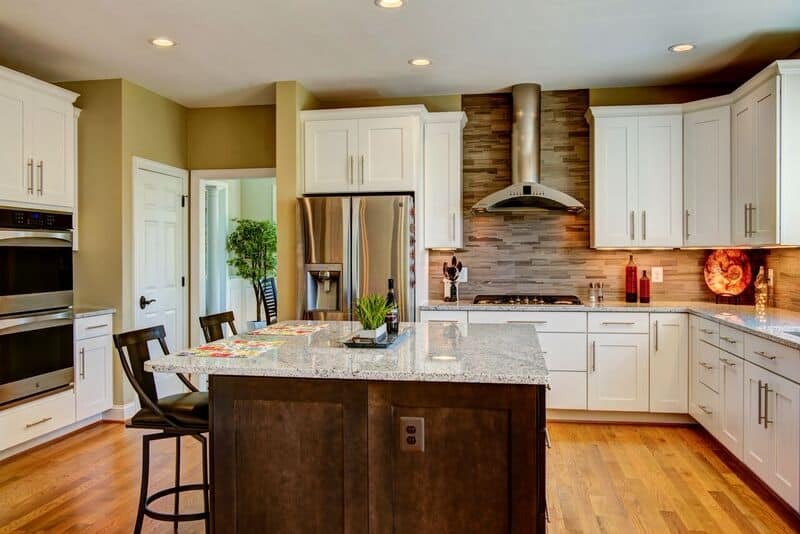 As a design/build company with professional experience in providing design assistance, Rendon Remodeling & Design is ready to help you begin the process of designing your transitional kitchen space. Call today for a complimentary consultation.